Features a unique patented oil-injection system A unique patented oil-injection system provides reliable performance by eliminating spark plug fouling and carbon buildup. The no-mix system is an added convenience for operators. Plus an amazing fuel to oil ratio of 120:1 allows for longer and cleaner running times...up to 65 hours on a single tank of oil. 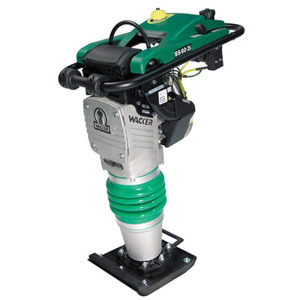 A low oil shutdown switch prevents running the rammer without oil for trouble-free operation.